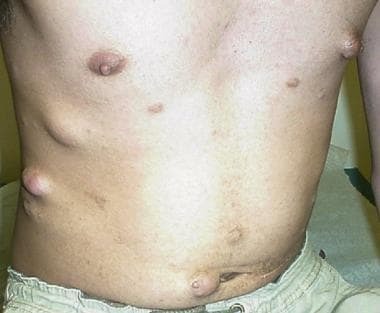 Neurofibromatosis, also known as von Recklinghausen’s disease, attacks in the nervous system. There is three types; neurofibromatosis type 1 (NF1), neurofibromatosis type 2 (NF2), and schwannomatosis. Some individuals with NF suffer from skeletal abnormalities, brain tumors, peripheral nerve tumors and other symptoms (Qin et al). NF2 causes most patients to become deaf. “NF1 is an autosomal dominant disorder affecting 1 in 2500–3500 individuals. A total of 50 % of patients with NF1 have a family history of the disease, or their clinical manifestations are caused by mutation of the NF1 tumor suppressor gene located on chromosome 17q11.2” (Quin et al). Four weeks after starting research on what scientists thought would take five years, they discovered what the NF1 gene does. Scientists believe the NF1 protein normally may serve as a brake on cell proliferation, preventing a cell from multiplying into a tumor (Bishop). “If the NF1 gene is damaged, as it appears to be in neurofibromatosis, it either cannot make the protein or produces a non-functioning form of it and the cell is no longer held in check. Instead it proliferates uncontrolled and grows into a tumor. Whether the tumor is malignant may depend on other genes in the chain of genetic events that lead to cancer” (Bishop). “About 4,000 people in the United States are afflicted with NF2. It is a condition characterized by the growth of tumors along the spinal cord and the auditory nerves. In most cases, the tumors become life threatening at some point and must be removed, which usually requires severing the auditory nerves. When the nerves are cut, complete deafness in both ears results, with no hope of help from either hearing aids or cochlear implants” (Pontoniere and Purpura). “The understanding of the development of NF1 has increased dramatically since the discovery of the NF1 gene in 1990…” (Murphy 38). Flat, pigmented birthmarks called café-au-lait macules, commonly appear on skin, they are an early feature of NF1. As those with NF get older, other typical features begin to appear, even a process in which their cells acquire the properties of cancer (Quin et al). The course of NF1 is unpredictable. Most individuals with NF1 will present with pigmentary lesions; CALMs, freckles or Lisch nodules and tumors called neurofibromas. In neurofibromas, the nerve fibers run through the tumor. This means that removing the neurofibroma always means cutting the nerve (Quin et al). Some individuals suffer from skeletal abnormalities, brain tumors, peripheral nerve tumors and other symptoms. About 40 % of patients with NF1 suffer from skeletal malformations, including primary bone hypoplasia and neurofibroma erosion. The overgrowth of related soft tissue leads to severe deformity, and it even affects the adjacent tissues and organs (Quin et al). Less attention has been paid to the effects of the disease on social function, emotional function, and quality of life. NF1 affects children and adults differently, both in its physical manifestations and in its consequences for the social and emotional functioning of the patient. “In 1996, researchers proposed a behavioral phenotype for NF1, after studying 20 children with NF1 in the age range of 6 to 17-years This phenotype was notable for a positive self-concept, predominantly internalizing behavior, such as anxiety, and social problems, including lack of social acceptance and peer support” (Murphy 39). Since this study, further work has been done to target different aspects of this proposed phenotype. “In 2007, Barton et al. investigated the self-concept of 49 children and 26 adolescents with NF1 in a questionnaire-based study. Although limited due to lack of a comparison group, their findings suggest a more nuanced self-concept in NF1 in which children tend to have a poor self-concept for physical abilities but an inflated self-concept of academic abilities. The difficulty in social interactions demonstrated by these studies led some to hypothesize that teenagers and young adults with NF1 may experience more loneliness; the hypothesis was supported by a recent report which noted greater loneliness in 60 NF1 patients compared to 23 unaffected siblings” (Murphy 39). These studies indicate that NF1 can have a major impact on the social-emotional functioning of children and adolescents, and must be taken into account when assessing and managing quality of life (Murphy 39). Hearing loss is almost inevitable in NF2 and is one of the main factors influencing quality of life in this condition. “In the past 25 years, the options for preserving or rehabilitating hearing loss in NF2 have expanded considerably. They found that in a cohort of 76 ears, 5%, 13% and 16% of patients experienced hearing decline over 12, 24 and 36 months, respectively. 28% of patients had hearing decline over the whole study period of 62 months” (King et al). There were 393 ears included in the study. “The mean tumour size was 13.8 mm, and during the follow-up period, the mean increase in tumour size was 1.5 mm” (King et al). The population included in these studies had relatively small tumours. They were likely to be patients early on in the natural history of their disease and probably tended to have milder phenotypes than the overall NF2 population. This may explain the relatively high proportion of patients with good hearing at presentation and the better than expected hearing preservation rates (King et al). “The proportion of patients who had serviceable hearing at presentation who maintained serviceable hearing was 64% over a mean period of 56 months. The proportion of patients with no hearing loss at presentation was surprisingly high in most studies, ranging from 71% to 85%. The hearing loss may be gradual, stepwise or sudden, with between 5.6% and 15% having sudden hearing loss. Lalwani et al. found that there was a correlation between greater tumour size at presentation and poorer hearing threshold. Hearing loss in one ear does not appear to be correlated with hearing loss in the second ear” (King et al). “Mr. White cautioned that speculation that the NF-1 gene is a tumor suppressor. He and other scientists said that if the speculation is proved correct, it raises hopes that a treatment for neurofibromatosis can be found” (Bishop). “If true, ‘we would know from which direction a therapy might come,’ said Peter Bellermann, president of the neurofibromatosis foundation. If the disorder is the result of the lack of the NF-1 protein, then the disease might be treated by supplying the protein as a medication” (Bishop). A miracle for NF2 patients happened with new technology known as the multichannel auditory brainstem implant (ABI), a collaborative effort between the Cochlear Corporation and the House Ear Institute, a private research organization that has been working with related auditory implant technologies for the last 15 years (Pontoniere and Purpura). The new device was developed for NF2 patients. “Researchers say the work on the NF2 implant will help in developing treatments for many other kinds of hearing impairment. 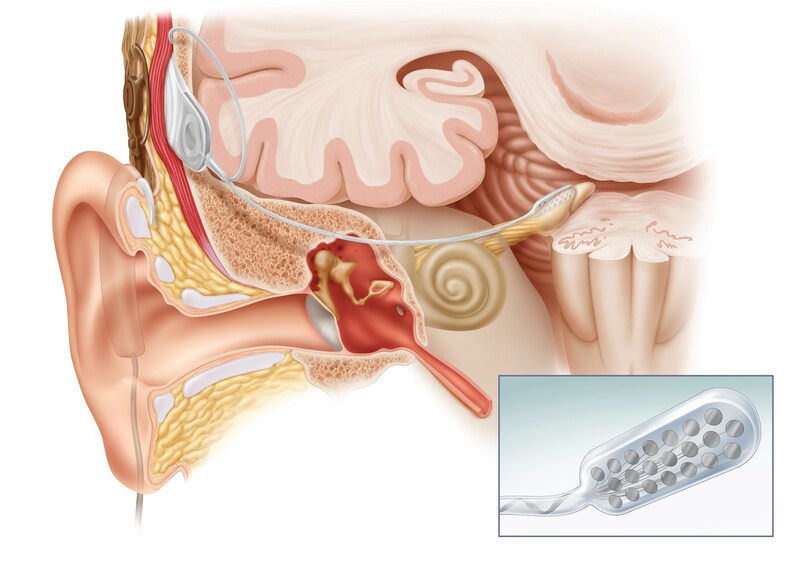 The NF2 device includes a tiny radio receiver implanted underneath the skin and eight 1-millimeter platinum electrodes implanted in the part of the hearing mechanism known as the cochlear nucleus.In 1992, the first NF2 patient was implanted with the device, and 26 patients had gotten it by 1996.” (Pontoniere and Purpura). Neurofibromatosis is an awful disease, there is not any cure and it can be deadly. With the discovery of the gene, scientists were able to learn more and with newer technological advances they are able to help with NF2 patients being able to hear again. All forms of the NF are mainly similar, but they do slightly differ. Most of the research found was in the 1990’s since that is when the discovery started, but they still have not found a cure or anything to help with the tumors besides removal if possible. Bishop, Jerry. “Scientists Find First Clues on how Gene could Cause Nerve Tumors.”Wall Street Journal, Aug 10, 1990, pp. PAGE B5. ProQuest, https://search-proquest-com.chaffey.idm.oclc.org/docview/398163410?accountid=41980. King, A.T., et al. “Hearing Optimisation in Neurofibromatosis Type 2: A Systematic Review.” The Canadian Journal of Chemical Engineering, Wiley-Blackwell, 26 Apr. 2017, onlinelibrary.wiley.com/doi/abs/10.1111/coa.12882. Pontoniere, Paola and Purpura, Mary “New Implanted Receiver Helps Restore Hearing.” Los Angeles Times (pre-1997 Fulltext), Apr 08, 1996, pp. 8. ProQuest, https://search-proquest-com.chaffey.idm.oclc.org/docview/293263767?accountid=41980. Qin, Haiyan & Chen, Wanying & Kong, Jiao & Chen, Feifei & Wen, Xiaoqiang & Li, Zhuonan & Zhang, Lianbo. (2018). Surgical Treatment of a Massive Neurofibroma of the Head and Neck in a Patient with Neurofibromatosis Type 1: A Case Report. International Journal of Morphology. 36. 194-200. 10.4067/S0717-95022018000100194. Previous Previous post: Should College Athletes Get Paid?